Trim root end off onion. Slice or quarter the onion, peel and all. Scrub carrots and chop into 1-inch chunks. 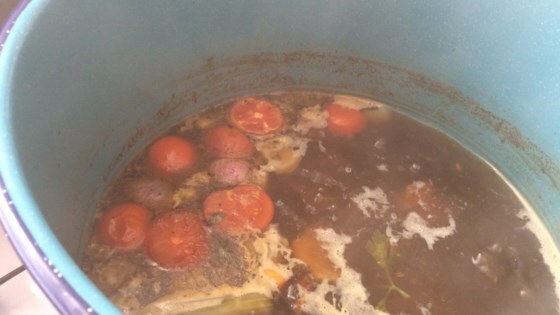 In a large shallow roasting pan, place soup bones, onion, and carrots. Bake, uncovered, about 30 minutes or until the bones are well browned, turning occasionally. Made this recipe using my Nesco roaster and am very happy with the result. This is a very easy recipe and smells delicious while simmering.